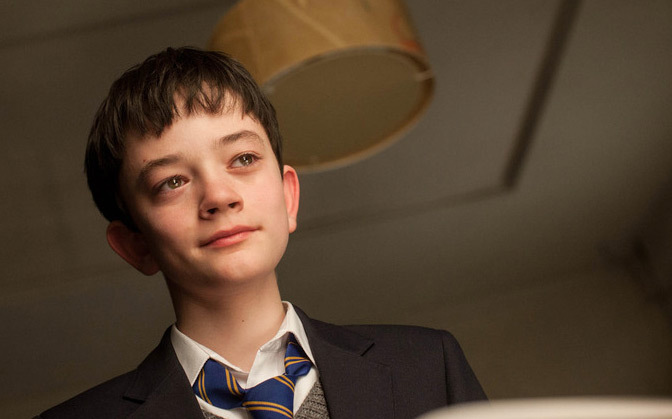 Lewis MacDougall was 12 years old when he filmed A Monster Calls. He is now 14 years old. His transition from being a junior drama club member in his home town of Edinburgh, Scotland to being in major motion pictures happened quickly. His club drama teacher saw his potential and suggested that he join the more advanced acting group. On his first attendance, the casting director Orla O’Connor visited scouting for young talent to be in Joe Wright’s Pan. After a lengthy audition process spanning several weeks and several audition sessions, Mr. MacDougall was cast as Peter’s best friend Nibs, who features in the early orphanage sequences of the movie. He enjoyed the stunt training and learning a Cockney accent for the role. He was signed at that point by an agent who subsequently brought him to the attention of the casting director of A Monster Calls. Whilst filming in Barcelona, Mr. MacDougall, a huge football (a.k.a. soccer, in the U.S.) fan, was lucky enough to see Barcelona play on their home ground. He has since completed filming the movie Boundaries, written and directed by Shana Feste, in which he portrays Vera Farmiga’s character’s son, and the grandson of the character played by Christopher Plummer.